Are you worried about malware and spyware plaguing your system? I have a cool, free tool that gives you an extra layer of defense when you're Web surfing. I also have two free utilities that can lock up and hide your sensitive folders and keep them from prying eyes. Plus, for readers who didn't like my earlier tip for disabling the Insert key, I offer a nifty program to watch your Insert, Caps Lock, and Num Lock keys. The Hassle: I have files--documents and videos--on both my desktop PC and my notebook that I'd like to keep private. Do you know of a sure way to do it? 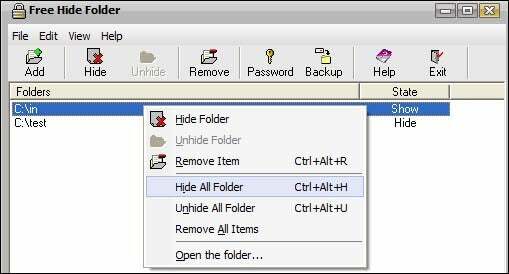 Free Hide Folder creates obscurely named, hidden folders to hold your private data. The Fix: If you just want to tuck away one or a few folders, use Free Hide Folder. This menu-driven and password-protected tool creates obscurely named, hidden folders to hold your private data. But it isn't secure: Directory Opus, an ordinary file manager, displayed the hidden folder when I tried it. And if someone on your machine searches for a file name in the folder (or even part of the file name, such as *.jpg), they can find the files and their locations. If you want to keep your folders hidden and secured, use TrueCrypt. A free, powerful tool, it creates an encrypted volume that you use as you would any other drive--but only you can access the files. To avoid losing your data, it's essential that you read the tutorial. The Hassle: Bad news, Bass. I strongly disagree with your tip to disable the Insert key [see "More Quick Fixes for Common Windows Annoyances" for details]. I use Insert often when filling in text over a form in Word, to prevent the rest of the line from moving to the right. My gripe is with Windows: It doesn't indicate whether I'm in insert or overwrite mode. So how about a tweak to show when the Insert key is enabled? The Fix: Download DK:Keyboard, and you'll see the status of the Insert, Caps Lock, and Num Lock keys in a system-tray balloon pop-up. Unzip the file and drag the executable to the Startup group. If you'd rather keep tabs on your Caps Lock, Num Lock, and Scroll Lock keys, use Vasilios's NumCapsScroll Indicator. Both tools are free.